Growing up on the shores of Lake Macquarie from the age of three, I was destined to become a fisherman at some point. My passion for fishing soon grew at around four years of age when I would go fishing with my grandfather in the row boat out the front of home when he would come to visit. He taught me everything he knew over the years and much of it still rings true to this day. I grew up spending countless hours, day and night, sitting on the end of the family home jetty catching small fish learning the skill of fishing. Like all fisherman the thirst for new species and new locations soon took over. It was in my early teens that I started to look at what freshwater species were available. Fast forward 20 years – the bream tournaments kicked off and the idea of pitting my skills against fellow anglers became appealing. I quickly moved onto chasing bass and trout, realising my bass and trout lures were equally effective in the estuaries as they were in the fresh. I started to read as many books and articles as I could find (pre internet) on lure fishing the estuaries. This was the beginning of catching fish on artificial lures for me. 2011 was a successful year for me with three tournament wins and numerous top five finishes. 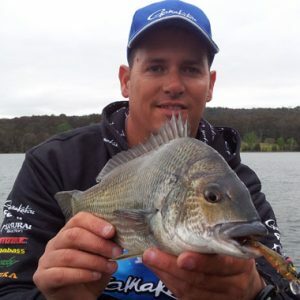 I turn 40 this year and the urge to fish tournaments is still strong, as a result I’m a regular at all bream tournaments throughout NSW and down into Vic, including ABT, BETS, GTS SSBS and Vic Bream series. With a family it can often be a tricky balance between family life and fishing (like most keen anglers), this wouldn’t be possible for me without the support and encouragement that my family provides me behind the scenes. When not fishing for bream I’m usually off exploring some new trout locations, walking the streams and rivers with a flyrod in my hand. 2012 marks my seventh year at tournament bream fishing, When not fishing I work in the NAVY as a Maintenance Manager on rotary wing aircraft (helicopters), where I have been for the last 15 yrs. If you see me at a tournament or a boat ramp do take the time to say hi as I’m always good for a chat and a laugh.